In 2008, when planning a wonderful wedding at the winter end of November, Mr Fletche and I never once gave thought to how we would celebrate our subsequent anniversary celebrations. And more importantly, with Christmas budgets looming, that it would not be feasible to jet off somewhere hot and sunny (a la our Maldives honeymoon) every year. So wedding anniversary Number One was spent in the pouring rain in London. Where to go for anniversary No 2? Where will be wonderful in November, even if it rains and snows? Our decision? To make the long (long) journey up the M6 from Birmingham to Edinburgh. I had visited with work on a couple of occasions – although had seen very little apart from the inside of hotel rooms – and had fallen in love with the city, so we packed our suitcases into the Mini-Fletchemobile and hit the road! With the beautiful scenary of Walsall, Stoke and Warrington behind us, we leave England behind… hello Scotland! It’s at least 10 degrees cooler this side of the border and the temperature gauge is now wavering just below zero. It’s 4pm. We are enveloped by darkness as we drive down little country lanes, and pass hills and meadows… and then suddenly, we’re smack bang in the middle of Edinburgh. At rush hour. On a Friday afternoon. Finally, we’re checked in! I had decided to put on half my layers when walking from the car, and am now sweltering as if in a sauna – which is probably a good job as the “heater” appears to be blowing out nothing but cold air… We play peek-a-boo with the glass bathroom door for a while, and I muse on how great it is to be able to watch the TV from the toilet… But with a city to be discovered, and drinks to be drunk, we struggle back into our warmest clothes to head out into the cold. I take one last longing look at my bagful of shoes, and opt for my furry boots – warmth over glamour tonight I think! 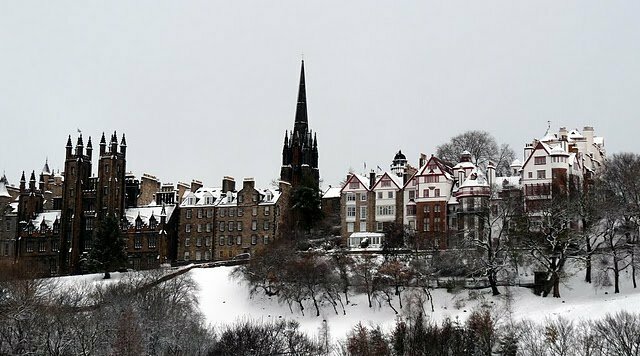 The hotel is a ten-minute walk from the Royal Mile – possibly only five minutes, but with the wind whipping in our faces, and the snow starting to fall, we were considerably slower that we could be… The pubs with their glowing warm interiors all look very inviting, and as the snow comes down heavier, we duck into The Tass (2015 note: now No 1 Edinburgh) for our first drink of the weekend. Not sure how a chilled pint of cider could make my cheeks glow so fiery red, we head back out into the snow. Next stop is The Albanach – a pub I can see us revisiting on a number of occasions over the next couple of days. We find a nice cosy nook to sup our drinks, before battling the elements once more. We head over to George Street. It’s almost ten o’clock; we have just 10 minutes to find Wetherspoons, find a table, choose and order! We manage to nab last vacant table in the place, and order without even looking off the menu. We can finally relax! Food is on its way, a drink is in front of us, and the snow continues to fall onto the Edinburgh streets. Mr Fletche and I spent a short time bickering about the correct order of the Chronicles of Narnia and then settle into companionable silence to devour our food. Typical Wetherspoons fare, highly unlikely to win any Michelin stars, but fills a gap all the same. The weather appears to have taken a turn for the worse since we disappeared indoors an hour or so ago… the conditions are now blizzardous… (Is that even a word?). The wind is whipping snow and rain and ice into our faces, and I have to hang onto Mr Fletche for fear of losing sight of him in the white-out blanket. It doesn’t help that Mr Fletche and I are both slightly “visually challenged” – even before the alcohol – and our glasses are now as useful as frosted glass. Do I keep them on and try not to think that I’m viewing the world through a waterfall? Or do I take them off and risk grabbing onto a man who is NOT my husband… I take a good hold of Mr Fletche first before popping them in my pocket for the time being. After a drink or two (or three), with the snow abating slightly, we decide to try and make a dash for the hotel. Now if only we can get that heating sorted out…. "USA Sept 2010 – “Star” Spotting in LA…"